Second chapter of this behind the scenes look at Yuri!!! On Ice’s design work, once again translated by Good Haro. Original article here. There were no new performance costumes in episode two, so this time we’ll be talking generally about the designs throughout the series. Almost all of the performers in Yuri!!! on Ice are male, so are there any particular elements to keep in mind when making men’s costumes? Good question. With female athletes, you can get really creative with the shapes of skirts and unusual materials and have a lot of fun with the designs, but with male athletes, it’s mostly either a top (sometimes a shirt and jacket) and pants, or a bodysuit configuration, so usually the top half ends up carrying most of the design. 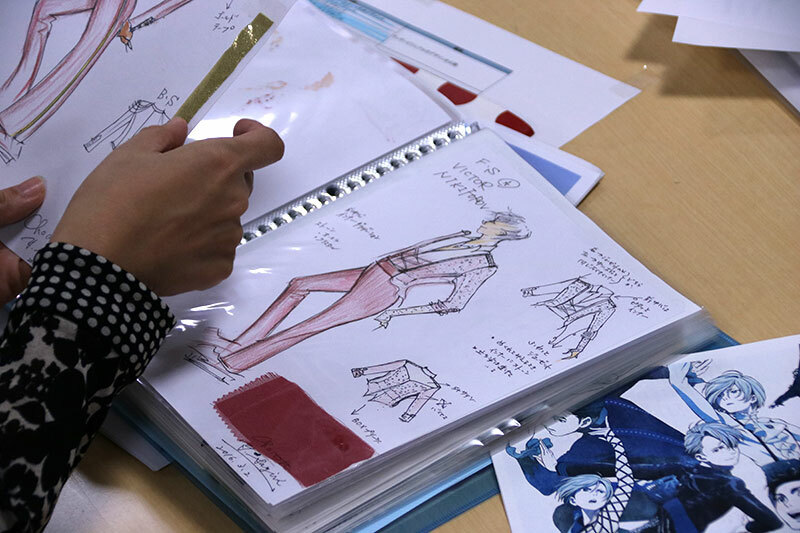 With the pants, the most important factors are the silhouette and using a stretch material. 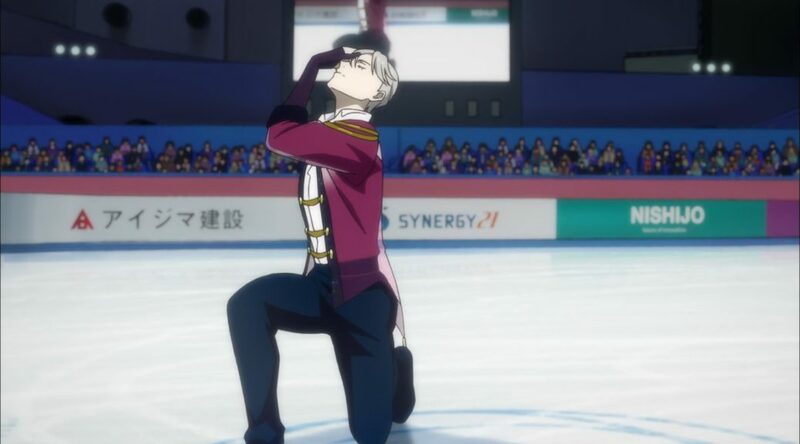 Yeah, in Victor’s outfit in the previous episode, his pants were simple black and all the detail was packed into the jacket, wasn’t it? Yes. Although it may be a jacket in form, it’s not regular clothing, so I got to have a little fun this time with the georgette-like material I used. Figure skating performances require the use of a pretty broad range of motion, so if you want to utilize a fabric that isn’t particularly elastic, you have to make sure you employ some other device to allow for sufficient movement. For example, during a sit-spin, the performer bends forward deeply, so the back stretches. But on the flip side, during something like a doughnut spin, the back compresses, and the chest stretches instead. The costume needs to be able to withstand that kind of manipulation and maintain an elegant shape when the athlete is standing. You also have to ensure that the parts of the costume that hang off the athlete don’t interfere with rotations during a jump. It’s the same with skirts for female skaters. The more material that comes away from the body, the more force it creates during spins thanks to centripetal force and it can interfere with the performance. 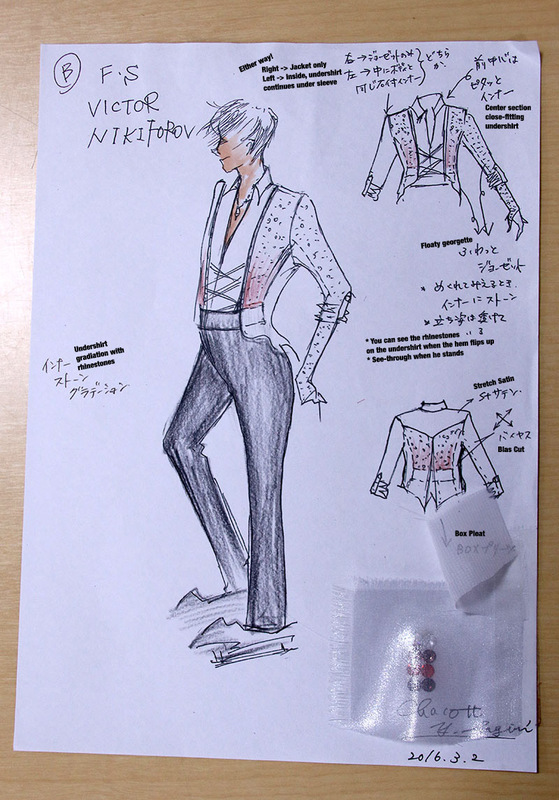 So even with Victor’s jacket [outfit], the center section is a close-fitting undershirt. Oh, so that’s why you have the instruction on the design sheet to cut the jacket on the bias*, huh? I can tell that you’re treating it like something that’s going to be produced for real. Yes. You’ve already seen several design sheets, but since I was designing the costumes as if they were real, I even included fabric swatches. I think it’ll be hard to convey the nuance of different fabrics in animation, but I was really impressed by the effect they used for the sparkling rhinestones in the previous episode! I heard they scanned a number of fabrics too, so I’m really excited to see what they do with that. Now I think I’m going to be wondering how the garments open the next time they appear in costume! You’re not going to be able to enjoy the story if you’re just focused on the costumes (lol), but it’d make me happy if I manage to surprise you with new discoveries when you examine them from a different perspective! TL Note: Since they don’t elaborate on this in the interview and those unfamiliar with clothing construction may be confused by this comment, so I thought I’d explain: cutting on the bias means laying out the pieces of a garment such that they’re cut on a 45 degree angle to the fabric’s grain rather than parallel or perpendicular to it. To make it easier to visualize, imagine a garment cut from striped cloth with the stripes running straight up and down the front. If that same garment were remade but cut on the bias, the stripes would run diagonally down the front instead of straight up and down. Bias cut gives even non-stretch fabrics a bit of stretch, so that’s why that instruction is included for Victor’s jacket. Also of note, the anime design for the costume differs pretty substantially from the costume design sheet in a few key areas if you pay close attention! Only her family name is given in the explanatory blurb before the articles (it’s the same in each one so I only included it in the first installment), but google suggests her full name is 佐桐結鼓. I’m not 100% sure on the reading of her first name, but it’s probably Yuiko Sagiri.